Yes, GMOs are safe to eat. That is the overwhelming consensus of scientific experts and major scientific authorities around the world, including the World Health Organization, United Nations Food and Agriculture Organization and American Medical Association. In the spring of 2016, The National Academies of Science, Engineering and Medicine (NAS) issued a comprehensive report where a panel of more than 20 scientists, researchers, agricultural and industry experts reviewed over 20 years of data since GMOs were introduced, including nearly 900 studies and tests and European and North American health data. They concluded – as other previous research concluded – that genetically modified crops are safe to eat, have the same nutrition and composition as non-genetically modified crops and have no links to new allergies, cancer, celiac or other diseases. Extensive and continued studies on GMOs are being conducted to ensure their ongoing safety. 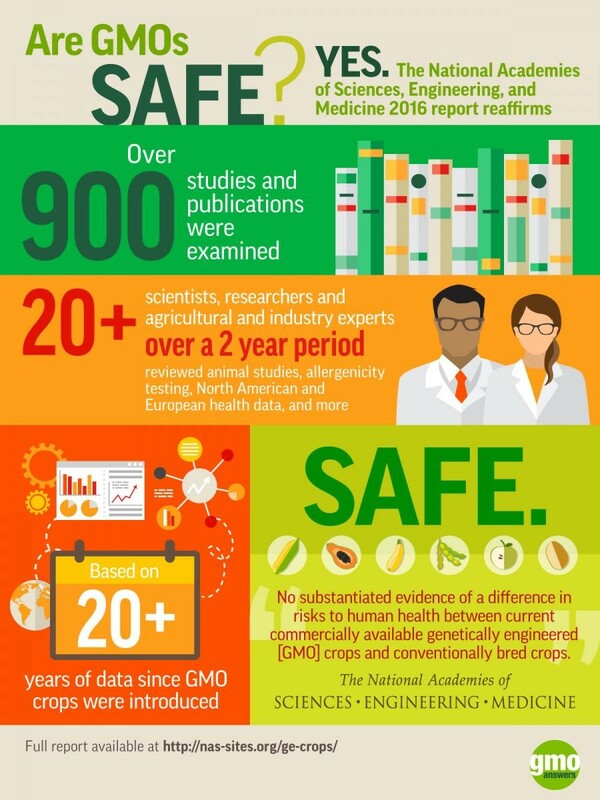 In addition to the NAS analysis, there are thousands of studies available confirming the safety of GMOs, as well as hundreds of independent studies. Genetically modified seeds go through an exhaustive research and review process before they come to market. 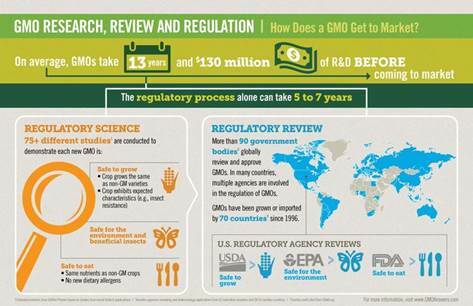 On average, GMOs take 13 years and cost $130 million for research, development and regulatory approval. On average, more than 75 different studies are performed on genetically modified crops to ensure they are safe for people, animals and the environment. This data is reviewed by up to three regulatory agencies in the U.S. – the USDA, the EPA and the FDA – and the GM plant must be approved by these agencies before it can be commercialized. Globally, more than 75 countries around the globe review, approve and import GMOs, and/or use GMOS in field trials. “Most people are not aware of the extensive pre-market testing that must be done before any GE crop is allowed to be commercialized. In reality, GE crops are tested 10-50 times the level of non-GE crops. The testing examines potential hazards and the likelihood of exposure to determine the overall risks for GE crops and derived foods."